Jhilli is located about 10 kms on concrete and village road from Jhargram via Gopiballavpur. You can wake up early as the sunlight is just appropriate for a great session of birding. Find yourself welcomed with the chirping/twittering by huge gangs of migratory birds in the lake. As you explore the place, find that the place contains a large water reservoir surrounded by lush greenery. Paddle boating facility is also available in the reservoir. You can use the boat to its best to sail through the reservoir and get as closer as possible to our feather friends. 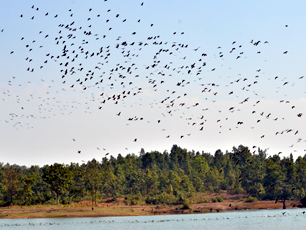 Kendua is a small village and a birding hotspot on Jhargram-Chilkigarh road. 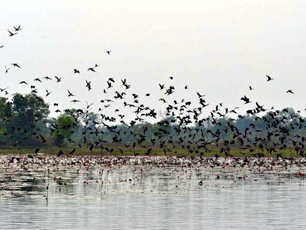 Migratory birds visit Kendua in the month of May announcing onset of monsoon and leave by November,they hatch their eggs and fly away. A walk through the Kendua village is more like a walk through the woods in a dense forest. The diversification of birds along with change of nature from time to time is mesmerizing. For a breathtaking experience in the lap of nature, Kendua village is a must visit for nature thirsty people. So don’t waste another minute and visit this village right now with your loved ones. Khandarani Lake is in Belpahari valley towards the north of Jhargram. 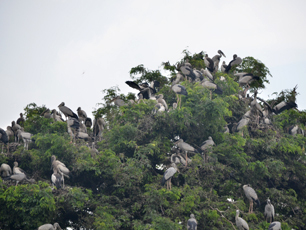 The attraction of bird watching in the pristine natural setting brings several tourists from bigger towns and cities. Most of the migratory birds are from Siberian plains in Russia, where frozen climate during winters force the birds to migrate towards south. Khandarani Lake and the surrounding hills are apt to for the Siberian birds' as a winter home. Most come out to bask in the sun from 11 pm to 2 pm, that is the peak time for bird-watching. It is advisable for you to bring your own binoculars to watch the movement for these birds. Hatibari is to just relax and enjoy nature you can simply spend an unforgettable weekend in the isolated jungle. Hatibari is located on the conjoint territory of the states of West Bengal, Orissa and Jharkhand and has rich wildlife. The chirping of birds in the forests of Sal, Piyal, Teak and Eucalyptus trees make the environment of Hatibari mesmerizing. If you are lucky, you can just manage to see a wild herd of elephants moving in all their grandeur and the monkeys on the canopy overhead. Dalma Wild Life Sanctuary is in the neighboring state of Jharkhand and can be reached through Jamshedpur which is 90kms from Jhargram. It is known as a paradise for elephants. 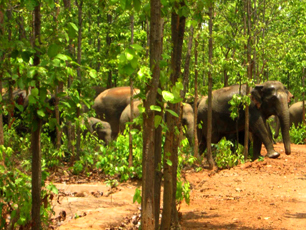 Beside elephants there are Indian giant squirrel, sloth bear, barking deer, wild boar, porcupine in the sanctuary. Commonly seen birds in the sanctuary are the falcons, golden oriole. There are small hideouts within the sanctuary to view the wild animals in their natural habitat.The sanctuary is an ideal spot for trekkers. 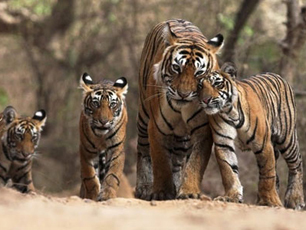 Simlipal National Park is in the neighboring state of Orissa. One can enter Similipal through Pithabata which is around 110 km from Jhargram. Entry permits can be obtained from the Range Officer, Pithabata check gate upon paying prescribed fees. Day visitors can enter between 6 AM and 12 noon and visitors with reservation between 6 AM and 9 AM. It is open from 1 October to 15 June.